Following the portrayal of Superhero characters of African descent in comics, books, movies, & TV, and the people who bring them to you. Luke Cage and Spidey swap origin stories and fashion sense in the Spider-Man: Web of Shadows video game. It looks they're just trying to out-flex each other. It's obvious one doesn't buy these games for the dialog. I know it's last year's game but I never played it. Have any of you? Great stuff right? I wonder where they got the music from. You can check out some more work from the artist, Jim Rugg, including some art from the book in this Flickr feed and this one. You might also be aware of some of their previous work called Street Angel (Paperback) which got great reviews. You can find out more about Street Angel here. 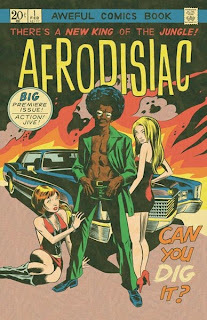 Anyway, the Afrodisiac Graphic Novel won't be available until December but while you're waiting you can check out the preview and don't forget to get your Afrodisiac Holloween mask just in time for the holidays. Soul Power Baby! You know about the green Hulk, the gray Hulk, and even the new red ones. Is the world ready for a Black Hulk? Moleculad was a member of group called Teen Force. 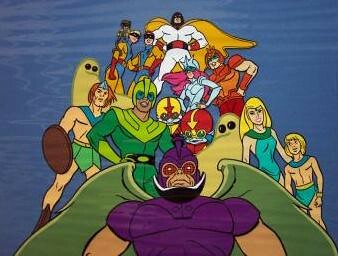 The Teen Force animated series was part of a larger group of animated heroes called Space Stars. Space Stars consisted of an updated Space Ghost, an updated Herculoids, and new series Teen Force, and Astro and the Space Mutts (the same dog character from the Jetsons). In this series, they all existed in the same cartoon universe. One of the things that made this series great for me was that while each had their own episodes, they would sometimes cross over and guest star in each others' series like they were old friends. Space Stars debuted in the early 80's. Teen Force had three main members. They rode their space motorcycles out of Black Hole X to chase down and subdue the evil Uglor. Kid Comet, the apparent leader, could move a faster than the speed of light and even crash the time barrier but he had to turn into some kind of fiery comet to do so. Elektra had the trifecta of mental powers, telepathy, telekinesis, and teleportation. (Aren't these the stereotypical female superpowers these days?) Moleculad was sort of an energy plastic man. He would convert himself into energy and go through objects, squeeze through tight openings or tie up the bad guys with himself. The character and his powers had potential but he was used poorly and was little more than an electro-rope most of the time but he looked sparkily good doing it. Finally saw Superman Batman: Public Enemies. Just in case you haven't, Black Lightning does indeed create force fields and is able to fly in the movie. Too bad he can't fly in the comics. He also has only one line in the whole movie, a waste of Levar Burton's voice talents. His mask is hideous too. The only character I feel more sorry for in this movie, which I liked by the way, was Power Girl. While she had a lot more lines and screen time, she was like a weak whiny baby throughout. 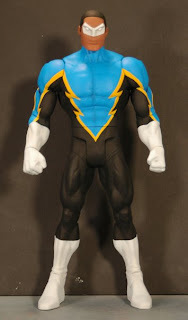 At least Black Lightning got an action figure out of the deal. The 1st day of the Long Beach Comic Con was great. While there I ran into Joseph Gauthier, the CEO of 10 Worlds Studio. He's the writer and creator of a comic called Lazarus: Immortal Coils. Check the preview. "LAZARUS: Immortal Coils #1, the first in a four-part miniseries starring the Biblical figure as an immortal warrior in a city built by demons where humans are used as hosts for an invasion." You can find out more here and on the official web site. 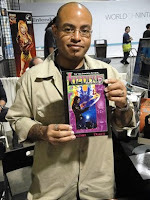 Joseph was the first of many Black comic creators I had the pleasure of meeting at the con. Lazarus: Immortal Coils is the premier comic for this company and I encourage you to take a look. Now that the last day is over I can honestly say I really did enjoy myself at the first annual Long Beach Comic Con, more than I thought I would. I got to see Stan Lee cut the ribbon. I met some positive and enthusiastic Black comic creators. I got introduced to a lot of new books to read. I got to see a movie screening. I got lots of useful and entertaining info at the seminars and I got plenty of schwag. The DC panel. (They revealed next to nothing and confirmed that there will be no use of Milestone characters beyond Static in the near future. They were pretty unapologetic about it too. Celebrities charging for their photos. (I know this isn't a new thing but I still don't like it.) I think that if you're a celebrity you should at least let your fans take your picture when you're at an event like this. The Man of Action panel (The creators of Ben 10). They were dynamic, good with the little kids, and enthusiastically answered every question put to them. The various writing panels and the online comic strip panel. Regardless of the crowds I got to see everything I wanted to see. Thomas Jane. He was really cool, laid back, and approachable, and posed for photos with fans for free. Did I mention the schwag? Anyway I'm already looking forward to the next one. I'll talk about the creators I met in future posts and will also provide a link to all the photos I took as soon as I've uploaded them all. Collecting Black Comix - Check out this GQ article - "Collecting Black Comix: African-American Superheroes and the Luke Cage Problem" . It's a great read.